Can I recycle UCO at home? You can store the UCO you generated, and then take it to a Green Point. RBA Ambiental will collect it from there to proceed with its correct disposal and recycling.o. How can we keep the UCO generated at home? Once cold, you should store the UCO in a clean plastic container (soft drink or water bottle) with a lid, and take it to a Green Point, preferably within 60 days from its use. Find the Green Point closest to you by clicking here. I am a small suburban generator of UCO. How can I recycle my UCO? Si Usted es un generador de aceite de cocina usado gastronómico o industrial, RBA Ambiental le brinda una solución integral al problema de su ACU. En RBA Ambiental realizamos la recolección de ACU (Aceite de Cocina Usado) a todo tipo de clientes, pequeños, medianos y grandes gastronómicos e industriales. Para comenzar con la correcta disposición de su ACU, por favor regístrese aquí. What kind of oil can I recycle? All kinds of cooking oils can be recycled, but they should not be mixed with mineral oils (car, machine, etc.) as they would contaminate your UCO and prevent it from being recycled. Where should I store it? In what type of container? If you are a household UCO generator you should store the UCO, once cold, in a clean plastic container (soft drink or water bottle) with a lid, and take it to a Green Point, preferably within 60 days from its use. 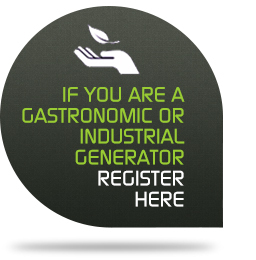 If you are a gastronomic or industrial UCO generator, RBA Ambiental will supply you, at no cost, with the right containers for the correct disposal of your UCO, dimensioned in accordance to the UCO generation volume of your establishment. RBA Ambiental will also determine, together with you, the collection frequency. What is it done to the UCO taken from my establishment? How can I make sure that after its collection it gets a responsible treatment? RBA Ambiental is the only company accredited both as collector and for the final disposal (operator) of UCO. Our company has the logistic infrastructure and the necessary procedures in place to guarantee the total traceability of each litre of UCO generated in the country, through to its final disposal. What is more, together with each collection service, your company receives a Collection Manifest, which is a UCO Disposal Certificate that guarantees that it WILL NOT be reused for human consumption. Is there an illegal market for the collection of UCO? Yes. That is why if you deliver your UCO to an illegal collector, you put the environmental and the food safety of your community at risk. Whenever you choose RBA Ambiental, you ensure the legal disposal of your UCO. What are the benefits of recycling Used Cooking Oil with RBA Ambiental? If you are an industrial or gastronomic generator of UCO, RBA Ambiental offers you an integral solution to your UCO problem. RBA Ambiental frees you from the responsibility, the costs and dangers involved in handling this residue. To know more about the benefits of relying on RBA Ambiental, please enter here. Is there another integral UCO Collection and treatment service in Argentina comparable to the one RBA Ambiental carries out? No. RBA Ambiental is the only company capable of offering an integral service which comprises from the collection to the treatment of the residue (UCO). Know more about the extra benefits that RBA Ambiental can offer to your establishment here. Is it mandatory for me to recycle the UCO that I generate? Yes. Every generator of used cooking oil is responsible for the correct disposal of the residue it generates. In some areas (e.g. CABA) UCO generators are obliged to enroll on a UCO generator registry and use the services of authorized collectors and operators for the disposal of its UCO. In case of non-compliance they are subject to sanctions ranging from fines to the closure of their establishments. RBA Ambiental complies with all applicable rules and regulations, at the national, provincial and municipal levels. What is the collection area covered by RBA Ambiental? RBA Ambiental covers all the Argentine territory, and already assists more than 7.000 gastronomic and industrial clients. Did you know that the UCO generators of the Autonomous City of Buenos Aires are obliged to correctly dispose of the UCO that their establishment generates?